Bizzy the Butterfly and the Over the Log Frog is the second audiobook in the Bizzy the Butterfly series. The stories are aimed at babies and toddlers combining a mixture of spoken story along with music. Miss M and Mister B were keen to sit and listen to the story. It follows the story of Bizzy the Butterfly who meet a frog with a log, who wants to jump over it to reach the river but as much as he tries jumping, his attempts are unsuccessful. Bizzy discovers an alternative way to reach the river and the frog is forever grateful to Bizzy for helping him. Thus the message in the story is about helping others. If you notice someone who is a bit stuck in some way, see if you can find a way to help them. As soon as the music started, my two were up dancing around. They also enjoyed the interactive questions that are asked at various points during the story, both trying to be first to shout out the answers. They enjoyed sitting, or should I say a combination of sitting and dancing around the room to the story of Bizzy the Butterfly and the Over the Log Frog. 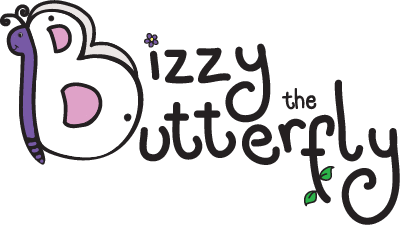 If you want to try one of the Bizzy the Butterfly audiobooks yourself, they can be purchased from Bizzy’s Shop, from as little as £1.50 for the mp3, or there are options for an audio CD and book, so why not head over there now and take a look for yourself.